Americans appear to be striving for the perfect way to eat. The start of the New Year is generally a good time to reevaluate daily menus and undertake something new and different. Television commercials are filled with the current fad diets. Book shelves beacon the reader to the latest craze. Whether it is the Atkins diet, the Keto diet, or the Whole 30 diet, which all emphasize the consumption of animal protein, the public is listening and enthralled. Almost three-fourths of the American population follow The Standard American diet which is rich in red meat, dairy products, processed and artificially sweetened foods, and salt with with negligible servings of fruits, vegetables, legumes, and whole grains. Protein is essential to a healthy diet. It allows us to function and is an important building block of bones, muscles, cartilage, skin, and blood. No diet should eliminate protein, and even a vegan diet should have enough protein. An incorrect belief among devotees of the Standard American Diet, (also known as the SAD diet), is that plant-based eaters have a shortage of protein in their diets. It’s understandable that the uninformed consumer might not have all the facts about plant-based eating. Nutritional research continues to delineate the differences between the SAD and Vegan ways of eating. The SAD diet, which encourages meat and dairy consumption, is considered a major contributor to our nation’s health crisis. Obesity, diabetes, and hypertension are among the diseases that result from eating a meat and dairy laden diet, whereas a vegan diet has been shown to reduce these illnesses. Is it possible to get enough protein in one’s diet without promoting illness? How we feed ourselves is a personal decision. Educating ourselves about what to eat can be the difference between health and illness. Considering what foods are nutrient dense is an important part of a healthy, protein-rich diet. 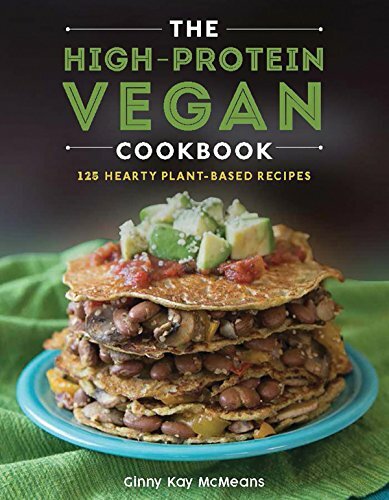 In her latest cookbook, The High-Protein Vegan Cookbook, Ginny Kay McMeans educates her readers on the fundamentals of protein and dispels any misconceptions regarding protein in their diets. She provides 125 vegan recipes that are chock-full of protein. In addition to offering protein-packed foods like seitan, tofu, and tempeh, she reminds us that by eating a variety of plant-based foods throughout the day the vegan-minded individual gets ample protein and nutrition. Plant-based diets consist of much more than just vegetables. Beans, soy, nuts, seeds, grains and greens are protein-laden additions to recipes. In the span of six protein-packed chapters, McMeans lures the reader into a world of protein-laden vegan foods from appetizers to powerful breakfasts, lunch bowls and energizing snacks. We encounter a diversity of protein vegan dinners made with seitan and tempeh. Desserts and sweets do not get their own chapter but appear as snacks in the form of cookies and a variety of sweet items. McMeans also maintains a website for her fans. “Vegan in the Freezer” is where she addresses her audience providing additional healthy vegan recipes to “enjoy now or freeze for future meals.” The photographs on the website as well as in her book are beautiful to look at. Since we first eat with our eyes, these pictures encourage the reader to bake or cook what they see. On her website she teaches her followers how to embrace the vegan style and methods. Some of her online recipes materialize into variations or templates for similar recipes in her book, but none are duplicated. The focus of her book is how to achieve protein power with a vegan way of eating. From Savory Quinoa Breakfast Cups to High-Protein Chocolate Blender Muffins made with black beans for an extra boost, to yummy Seitan Sloppy Joes and Caribbean Chili, the author does not disappoint. Every recipe has a twist where one or several ingredients include some form of protein. From quinoa, which is a complete protein, to chia seeds, vanilla protein powder (vegan of course), and hempseeds, she provides ingredients that are a powerhouse of nutrition. Protein is a crucial building block for our bodies. People from various cultures eat plant-based diets and have survived for centuries. Tubers like white and sweet potatoes, starchy vegetable like corn and peas, and whole grains and legumes have fed different people from foreign destinations for centuries. There is a lot of fuss over protein, but the whole foods plant-based individual averages more protein than they need every day. “We live in a society in which we have been willfully misled to believe that meat and dairy products are the sole source of dietary protein worthy of merit.” Ginny Kay McMeans shows us how to create recipes that dispel the myth that vegans don’t get enough protein. Frances E. Abrams is a vegan chef who has taught cooking at the Brookline Center in Brookline, Massachusetts as well as privately. She has extensive training in both macrobiotic cooking and vegan cooking at the Kushi Institute in Western Massachusetts, and with Christina Pirello, the leading authority on natural and whole foods, in Philadelphia and Italy.